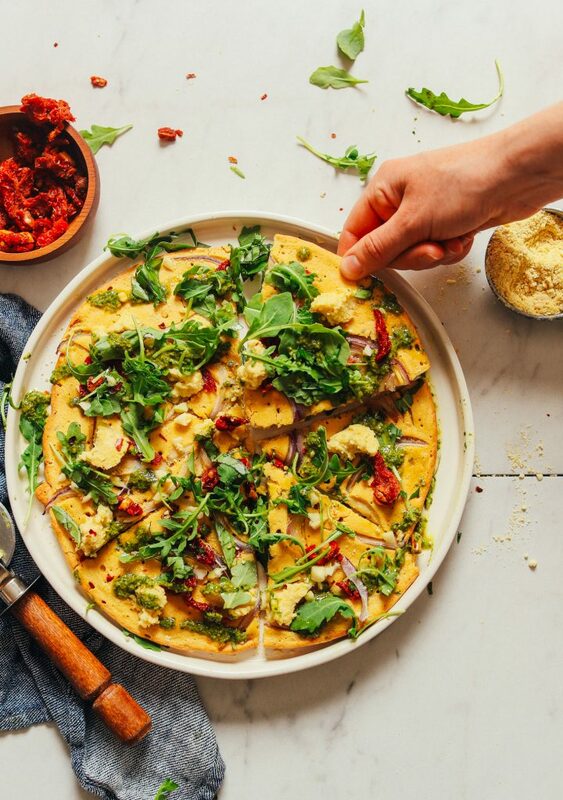 That’s why I’ve put together this list of pizza night faves for fall, plus a few FoodieCrush favorites that’ll make you forget all about dialing up to order your delivery-style pizza, and make it at home instead. My favorite, no-sweat pizza dough. The best way to reheat pizza to perfection. One of my fave recipes for leftover pizza dough. Forget baking, this is why you should fry your pizza crust instead. This video, and yes, I too WILL take a side of Ranch dressing to dip! Don’t save your apples for good old-fasihoned pie, try this savory seasonal pizza pie with bacon, blue cheese, and maple instead. Fennel and sausage are as close a pair in Italian cooking as Thelma and Louise are on the road, and they deliver just as much of a delicious punch. 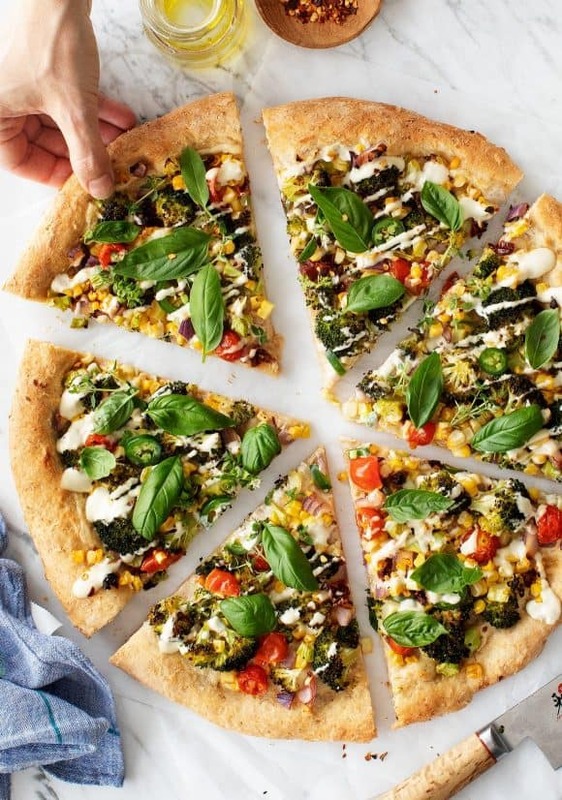 If you’re not into veggies as your crust, pile them on TOP of your pizza for a healthy and colorful pie with a luscious cashew cream drizzle (or dunk–I won’t judge). A thick crust in a deep dish with a chunky sauce, this is a pizza diehard Chicagoans will never give up. Socca-it to yourslef (haha) with this chickpea-based pie. Don’t be intimidated if you’ve never used garbanzo flour before–this comes together in under an hour with only 10 ingredients and one bowl. Break out your cast iron skillet to serve up this showstopping authentic dish. Potatoes and salami are paired with a few time-saving ingredients for a unique dish with flair to spare. There’s no need for tomato sauce on this flavorful mushroom pie, and with a salad on top. it’s a Friday night dinner that’s one and done. 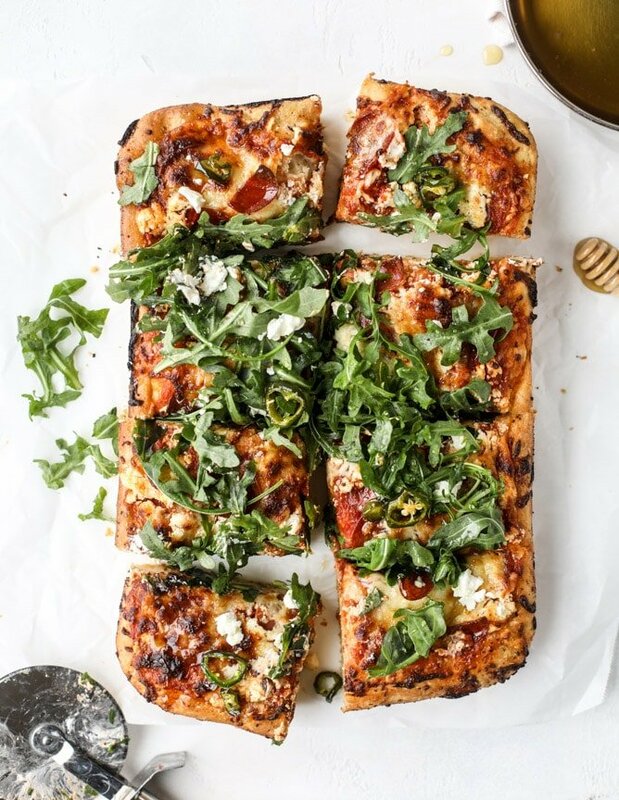 Wrap your had around this sweet and spicy take on thick-crust pizza–your tastebuds will thank you! 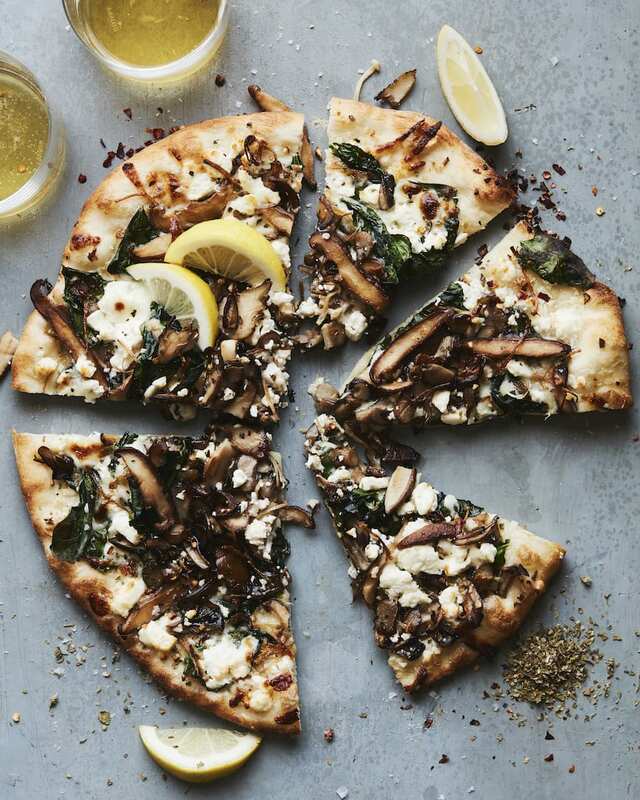 Whip up the white pizza of your dreams with loads of garlic, caramelized onions, mushrooms, spinach, and salty feta. A touch of lemon adds a sincere sophistication you won’t want to miss out on. No need for wings here! Triple cheese, chicken, and spunky banana peppers make this easy sheet pan pizza extra special. It’s gluten-free but easy to do and doesn’t require much fuss with the secret ingredient that yields a pie where you won’t even miss the yeast. Annaliese advises to let your dough rest after it’s risen and punched down—it relaxes the gluten, making it a little less elastic and easier to mold and roll. A hot cast-iron skillet creates a crispy crust topped with a chunky tomato sauce and everyone’s favorite pizza topping: sausssssaaaage. Italian for “devil”, Diavola bring this veggie-topped pizza from Alex and Sonja’s travels to the spicier slice of life when they make it at home. I have nothing against carbs. But if you’re looking to add more veggies, or lighten things up a bit, I am ALL about this cauliflower crust alernative. My husband’s favorite slice of pie, if you’re a Hawaiian pizza hater, then you probably won’t like the fact that we love it dipped in Ranch dressing, too. Sweet, savory, and with all the right moves. If Chris Hemsworth were a pizza, this would be it. Check out more of my pizza recipes here. So here’s the big question, what’s your favorite pizza topping or the best pie you’ve ever had? Let me know what you think, and what other recipes you’d love to see. Heidi, thank you for the 3 gluten-free crust recipes! I’m looking forward to giving each one of them a try. thank you for all of these, have to say that Pesto Pizza with Balsamic Chicken and Peaches gets the award for most creative, thank you! And now >>> I NEEEEEEEEEEEED PIZZA!! Every single one of these pizzas looks fantastic to me. Thank you for sharing mine!